Mille Feuille. Is there anything more dreamy? Generous amounts of creamy, vanilla-flecked crème pâtissière, sandwiched between layers of crispy, flaky, buttery puff pastry. Traditional versions are topped with a layer of icing or fondant, but I want nothing to get in the way of the crème-and-pastry magic. Mille Feuille was my weekend baking project, to take to my friend Jess' house for dessert. Mille Feuille is one of her favourite desserts, and I had my puff pastry that needed using. The night before, I took 2 patons of pastry from the freezer and gave them their final 2 turns. I then rolled them into large rectangles, and heavily docked the pastry (i.e. pricking it all over with a fork). This prevents the pastry from rising too much in the oven. The next morning, when completely cool, I sliced and trimmed the pastry into 4 even pieces. By the next morning, the crème had unfortunately solidified into a big rubbery disc - I bet if you threw it on the floor it'd bounce right back up at you - definitely not suitable for spreading on frangible pastry. I took a tip from the masterful Roux Brothers, and folded some whipped cream through to lighten it up. (The way you do when making their croquembouche). It wasn't completely smooth, but still, it was light and spreadable, and the colour had softened from intense sunny yellow, to a pale cream. Lovely. As you can see above, I did have 4 pieces of pastry. I used 3 to make the big mille feuille, and I sliced the remaining piece into thirds, and made a mini one to share with some other friends and family. I didn't follow a recipe per se, but used those pieces of pastry and one quantity of crème pâtissière (i.e. 4 egg yolks, 500ml milk, 1/3c castor sugar, 1/3c flour). There was enough to fill the layers generously, with some leftover for the all important taste-tests! (Eating the offcuts of pastry with the excess crème is cook's treat). You don't have to make the pastry yourself, with fancy Ardennes butter, but I'd definitely suggest making the crème yourself. (Google a recipe, there are gazillions out there!) It's not too difficult, and much better than anything shop-bought. 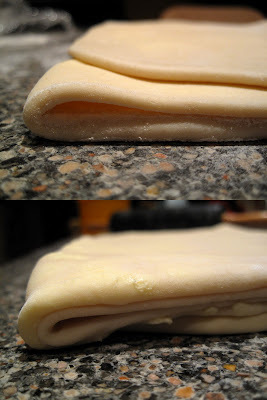 Although, come to think of it, puff pastry isn't that difficult to make, it's just a time-consuming, annoying process. While researching mille feuille recipes online, I came across way too many recipes that used frozen puff, and custard from a carton. Blergh! Carton custard surely has its place (mmm... in a boozy trifle perhaps), but not in a dessert where it's the dominant flavour. I loosely glad wrapped the mille feuille on the tray you see above, and, driving about 20km below the speed limit, made my way to Jess' house. Luckily, both the dessert and myself arrived unharmed and on time. We were treated to a wonderful, Masterchef-inspired lunch (10 points Jessie!) of sliced potatoes stacked with coriander and dill sauce, mixed salad leaves, Bulgarian fetta and char-grilled lamb with a red wine jus. (There is something about those Meditteranean, oily-green sauces, seeping into still-warm boiled potatoes that is truly delicious). It was not too huge a drama to slide the mille feuille from tray to chopping board, or even slicing it. (With my trusty super-sharp Wusthof bread knife). For slicing something as delicate as this, I recommend a sharp serrated knife, and gentle, horizontal sawing motions. Whatever you do, don't simply press down, unless you want custard squishing out all over the place! Of late, I have been super busy and tired with work, and ashamedly resorting to take-away and freezer meals, even on weekends. No more! I've made this at least twice before, (in '05 and '07), and was reminded of it when I saw cheap Portobello mushrooms at Colonial Food Market in Doncaster Shoppo. I picked up some parsley and some sourdough rolls from Bakers' Delight (not foodie-chic, but they did the job)... and dinner was sorted! You smear the mushrooms with a mixture of butter, garlic and parsley, and grill until cooked and juicy. Then you shove them in a Dijon mustard-smeared bun, squeeze with lemon, and eat. I added some baby spinach leaves for extra vitamins. The bread wasn't too bad, but it was very sour (i.e. more sour than normal sourdough), and super-duper chewy. I think toasting the bread first might have been a good idea. After enjoying the Superfood Salad served at Match Bar, I decided to google the recipe and give it a go myself. (Link to recipe is here!) It's pretty easy, but kinda time-consuming - quinoa, broccolini and peas all have to be cooked separately, but the result is ultimately rewarding. It's so virtuously nutritious and filling. As you can see, I served it with some rare-grilled tuna - wonderful. Last Saturday night's dinner was going to be a simple yet decadent Aufschnitt (cold-cut dinner) of salami, triple-cream brie and light-rye bread, but in the afternoon I realised my cousin Gina and my niece Cheryl would be coming over to hang out, and decided to pad out the dinner a bit. I made a batch of Nigella's delicious eggplant, saffron and yoghurt dip, some taboulleh (with red quinoa replacing the usual burghal) and some Lebanese-style garlic chicken wings. I think there are a gazillion versions of classic Lebanese garlic chicken wings, but I follow the recipe from How to Eat, which involves boiling the garlic cloves first, to mellow the flavour, before mixing it with lemon juice and slathering it on the chicken wings. This one is (gasp!) my own creation, which is big news coming from a girl who slavishly follows recipes. Inspired by the success of the garlic chicken wings and taboulleh, I was planning a weeknight re-run. However, by the time that weeknight came around, it was freezing, and I wanted comforting rice, rather than refreshing salad. I cooked onions with spices, tossed in some basmati rice and red quinoa, added stock and chopped broccoli, clamped on a lid and let it cook through. When it was cooked, I tossed through some soaked sultanas, chopped parsley/mint, and toasted nuts and seeds (pine nuts, almonds, sunflower, pumpkin). Yum yum. It was pretty substantial, and would make a nice meal with or without the chicken wings. (Pilaf fans should also consider checking out Nigella Lawson's Safron-Scented Chicken Pilaf). To make this pilaf truly "super", I'd probably suggest using brown basmati rice - does anyone know where to find this? I also considered using famously super cranberries instead of sultanas, but wasn't sure if this would taste too sweet. Perhaps next time I will be more adventurous. Nigella's chocolate espresso cake is one of the dreamiest, most delicious chocolate cakes I've ever made. I don't make it that often (most recently in '05 and '07), but that's only because I'm always on the lookout for new cake recipes. I whipped this one up for my Mum's birthday last week, after coming home from work and before going out to Quan Jude. (It's not nearly as labour intensive or impressive as the croquembouche I made for Mum's birthday last year, but I knew that she'd love it anyway). It's quite like a whipped sponge cake (i.e. whole eggs whipped with sugar until at least doubled in volume), with melted chocolate, butter, vanilla, coffee powder and a touch of flour folded through. It looks like it would be rich and dense, but it is, in fact, feathery light. The genius part of the cake, though, is the cafe latte cream - cream whipped with melted white chocolate and coffee powder. It has a beautiful, rich intense flavour and perfectly matches the cake. You can spread it on top of the cake, although I prefer it on the side, so you can preserve the rustic beauty of the matt-brown cake. I forgot to sprinkle the cake with coffee liqueur, but no-one seemed to notice. I tend to think of this cake having a grown-up flavour, but my 14-year old niece loved it. I love this cake for dinner parties, as it can be made in advance, and looks and tastes gorgeous. And for someone who ate duck, noodles, rice, dishes AND dessert earlier that evening, I somehow managed to polish off 2 slices. Oops. "The best part of the duck"
Quan Jude - Peking Duck specialist since 1864 - is currently having a winter special - $60 for a Peking Duck. Score! After I read reviews here and here, and my dad heard some good recommendations from his friends, we decided to try Quan Jude for my mum's birthday this year. The Melbourne Quan Jude is located on the corner of LaTrobe and Queen street, (you know, that building with the massive arty picture on it that changes every few months - it used to be a naked lady with bunny ears, now it's a chef). The restaurant floor is one level below the ground floor, and is very open and spacious - a little too spacious, perhaps, which leaves the room feeling a bit cold and empty. The main colour used is yellow, unlike the traditional red we see at most Chinese restaurants. I like it. The mannequin on the stairs wearing a traditional Chinese outfit did freak me out a little, however. We ordered 2 ducks between the 8 of us (which included, fabulously, my cousin and her daughter who surprised us from Malaysia - yay! ), which turned out to be a generous, but not too generous amount. 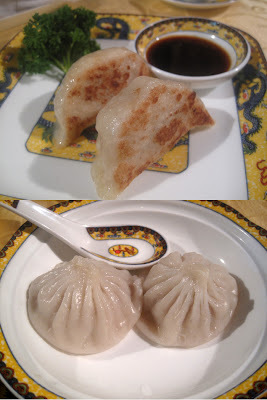 Because the ducks take some time to prepare, our waitress suggested we order some dumplings first - steamed crab for our seafood eaters, and fried pork for our non-seafood eater. I quite like the steamed crab dumplings, which were fresh and meaty. There were a few little pieces of crab shell in there, but this didn't bother me too much - at least we knew they had real crab! The fried pork was, apparently, "good, but not as good as Best Food Gallery in Box Hill", hehe! I love the duck plate - it reminds me of the gorgeous Pillivuyt Duck Head Plate my dear friend Lisa bought me. The "best part of the duck" (i.e. crispy crispy fatty skin) placed on a separate plate to be savoured even more. You get a certificate explaining that this is the 1,000,000th (or whatever) duck that Quan Jude have served - very cool, but we couldn't figure out exactly how they know exactly what order your duck is, when there are more than 50 outlets in China and Japan, as well as here. We guessed that Quan Jude's International Association of Peking Duck (or something like it), just sends out a new batch of cards whenever one of the outlets tells them they've nearly run out. Cucumber & spring onions on the left, sauce on the right. In addition to the small individual plates with accompaniments (above), we were given extra to share in the middle of the table. The pancakes came in a cute steamer-basket..
... and were gorgeously thin and soft. Oooh... thin like strudel pastry. I really, really loved the duck - partly for the fact that there was heaps to be shared amongst us - it was so tasty, so juicy, so crispy. The pancakes were very soft, balancing out the firm and crispy duck. The mains weren't as good as the duck, but not nearly as bad as has been written in other reviews I've read. The beef was cut into pieces that were slightly too big, and the fish was a bit too salty for my tastes, but those are the only faults I found with the meal. The mushrooms were deliciously slippery and fresh, and the deep-fried prawns were particularly compulsive. (But only if you like salted egg - luckily I do, and so does my gorgeous niece!) The E-Fu noodles weren't quite as impressive as the Flower Drum's, but still good. We were absolutely stuffed by the end of the meal, and were going to skip desserts (y'all know I already baked mum a cake), but the waiters realised it was our Mum's birthday and organised a couple of plates of sweets. 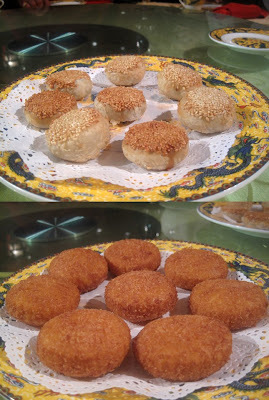 These are what I think of as very Chinese desserts - oily, not too sweet and with that mouth-filling peanut-butteryness that some people find delicious, and others find totally offputting. I can eat them, but am not super-keen on them in general. I did think they were well done though. Quan Jude is an above average dining experience. We found the service to be professional and friendly, and enjoyed the food, especially the duck. The non-duck items are quite pricey though (e.g. 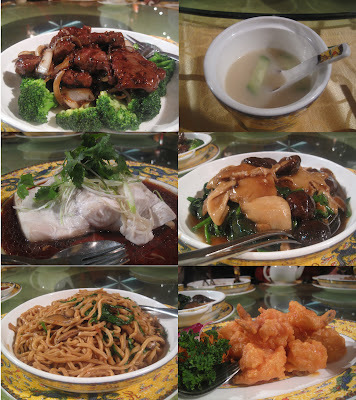 $39.50 for prawns, $36 for beef etc), and not particularly better than other Chinese restaurants around town - so I'd keep that in mind when ordering. Definitely worth a visit. Al: Sarah, are you guys coming up to my holiday house in July? My friend Allstar (who I seem to have cooked for quite a bit over the years) is, for some reason, obsessed with my cheese stars. (Which are, in fact, Nigella's cheese stars, from How to Eat). When we went up to his holiday house last weekend for general mayhem (of the guitar hero variety), I brought a quadruple batch of cheese stars with me. I wasn't feeling particularly energetic, so instead of rolling out the dough and cutting out stars, I decided to roll the dough into a big log and slice off rounds to bake. (Like what I did at my mum's birthday last year!) I forgot to take any photos, but I'm sure I've made them enough for you to get the gist. Of course, that shortcut gave me a bit of extra baking time... and I knew this would be the perfect excuse to make David Lebovitz's Cheesecake Brownies. I saw the recipe some months ago on his blog, and, after prising my jaw off the floor, bookmarked the recipe. And even though I could have made them for any old weekend, I knew that such intense double deliciousness would be best shared amongst a large group. The recipe was quite simple to make, but I found it a bit difficult to swirl the soft cream cheese mixture through David's stiff (heh) chocolate batter. The given quantities make a rather alarming amount of cheesecake swirl, and although I was a bit apprehensive about it, the chocolate batter does expand in the oven. 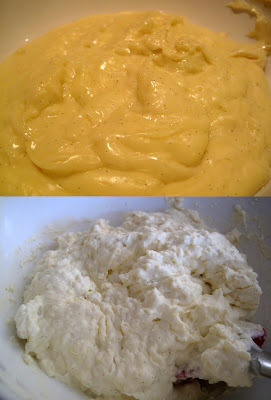 The cream cheese taste is quite dominating, so I'd reduce it by about 1/4 ~ 1/3 if you're not a fan of the sour taste. I packed ze gorgeous swirly brownies in a Tupperware to transport up to Al's place and then stacked them up in a rather resplendent brownie pyramid. As you can imagine, these babies are incredibly rich, and best enjoyed in small pieces with a cup of tea or coffee. The richness didn't seem to stop my friends however - I ate a couple after I arrived, had a short nap, and when I came back the plate was empty! Check it out peoples! Flaky flaky flaky puff pastry, woo-hoo! A short time ago my Dad surprised me with a copy of Snowflakes and Schnapps, an absolutely gorgeous new cookbook from Jane Lawson. Thank-you to Dad! 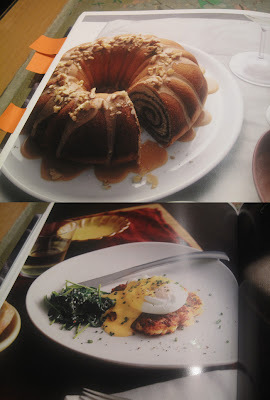 The book is Winter-themed, and features recipes from the cold-climate countries of Europe - Germany, Austria, Russia, Scandinavia and so on. Right up my alley! Snowflakes and Schnapps is stunningly presented, from the white patterned cover, to the cute embossed snowflakes dotted throughout the pages, to the gorgeous photographs. They are heavily styled - linens, candles, coloured glasses and fake snow abound - but this is pleasing, rather than pretentious. My style hero Colin Cowie would no doubt approve. Cookware addicts such as myself will enjoy spotting the different products - the Chilewich placemat, the Bodum double-wall thermo glasses, the Essential Ingredient teardrop bowls, to name a few. But most importantly, the food looks seriously delicious and inviting. On my first flick through, I bookmarked at least 15 recipes as "must try soon". The chapters are arranged, surprisingly, not by region or type of food, but by the vibe. We have Baby It's Cold Outside (small bites, soups, hot drinks); Warmed to the Core (breakfasts, slow-cooked recipes); Diamonds and Fur (luxurious and glamorous dishes - think blini and caviar); and Dreaming of a White Christmas (explanation not necessary). I love the commitment to the concept. My only criticism of the book is that apart from a brief introduction to each of the chapters, Snowflakes offers very little in the way of explanation or text. This can make the book feel, for want of a better word, cold. Whilst many recipes are easily recognisable, like cherry strudel and beer-cooked bratwurst, some recipes seem to be Lawson's modern interpretation of cold-climate deliciousness - for instance the pannettone, chocolate and marshmallow melts. I would have loved to read what her inspiration for this recipe was, as well as explanations of the many unfamiliar recipes, like the Karelian open pies (rye pastry filled with a risotto-type mixture), the garlicky pelmeni dumplings or the poppy seed and walnut potica with coffee glaze. Imagine, at a dinner party, being asked, "Ooh, where are these pelmeni from?" And answering, "I dunno, Europe somewhere?" Hehe. Well, I've got Google. Now, the first recipe I tried was veal cutlets with wheat beer sauce and winter vegetable strudel. Ya-huh, how good does that sound?? It was a special dinner for the whole family, where we all - OMG - actually had an evening to sit down and eat together. Yay! ...rolled up like a strudel and brushed with butter. It was a bit too big for my tray, but never mind. While it's baking, you fry the chops and make the sauce - simmering wheat beer (I used Redback - yum!) with honey, stock, sage and raisins. It becomes a kinda sweet-and-sour caramelised syrup. I was nervous that the pastry would collapse, or that the strudel wouldn't cook through, but luckily there were no crises, and it came out flaky and golden. Use a sharp serrated knife to slice it though, or you'll just mush it up. And - here we go... dinner! I actually used pork chops instead of veal chops, because the pork chops at the market (free range Otway, thank-you-very-much) just looked beautiful. And they were only $2 a kilo more than the conventional pork chops. Win win! You'll see that the fat on the side of the chop kinda crisped up a little in the pan, but I didn't get attractive crackling on the side. Maybe a blast under the grill would help? This was an absolutely wonderful meal, well balanced in flavours and textures. It was quite a bit of work, especially for a Wednesday evening, but y'all know you don't have to make your own puff pastry. I just happened to have it on hand. And I felt more than a little beam of pride as we placed it all on the kitchen table. I can't wait to try more recipes from Snowflakes and Schnapps. Those of you who follow my Twitter will know that I spent the greater part of my Saturday evening making puff pastry. I had a few spare hours, and quite a bit of that French butter that needed using. The aim, by the end of the evening, was to have a batch of delicate butterfly-shaped palmiers to snack on, plus a few patons of pastry to keep in the freezer. Things didn't quite eventuate that way, but the evening wasn't a total loss. Let me explain. Disclaimer: What follows is merely a summary of the steps I took when I had a go making puff pastry - definitely not an instruction guide! Here and here are the most useful online guides that I found. I followed the Roux Brothers' recipe for puff pastry, which is quite similar to their croissant recipe, except that the dough is not yeasted. Again, like croissants, the process is long and fiddly - you will probably want to give up more than once. Due to all the waiting and resting times, I recommend having a mindless DVD to watch in between - Blades of Glory for us. The dough. I should have kneaded it a bit more, to get it "completely homogeneous", but I was erring on the side of caution and didn't want it to get tough. The pastry needs 6 turns in total before it is ready to use, but for some reason, once you've done the last 2 turns it needs to be used within 3 days. If you plan on storing it, you only do 4 turns, and complete the final 2 turns just before you use the pastry. With this in mind, I took about an eighth (1/8) of the pastry to make palmiers, and did the final 2 turns. I then let it rest in the freezer for the specified time (10 minutes), and tried to roll and shape it. Yup, I failed. The dough was super-sticky and kept breaking. Argh! I tried persevering and rolling it back together, but this also failed. In frustration, I shunted the dough back in the fridge and did some serious Googling. This is where the second article I linked really came in handy - unlike certain fancy shiny French books *ahem* - it has a troubleshooting guide. There was no point mooshing the dough back together, because once the integrity of the layers is compromised, the dough is stuffed. I learned that throughout the whole pastry-making process, it is important to keep the dough cold to prevent the butter melting and oozing out. You also need to keep the worksurface clean, scraping away the flour and dough after every single turn, so that the dough doesn't stick and tear. Oops. So, the main problems were that I didn't let the dough rest long enough after the 6th turn - had no probs up until then - and that I didn't keep scraping the board completely clean of flour/dough, so it kept getting stickier. "Not very well", is the answer. Those 250 grams of dough that I wanted to make into palmiers ended up in the bin. *Sob! * Thank goodness I still had the majority of the pastry still sitting, untroubled, in the fridge! I just couldn't let those burnt lumpy pieces of dough be the rewards for a whole evening of rolling and bashing and turning. I scrupulously scraped and cleaned the bench, and got another small piece of pastry from the batch, carefully did the last 2 turns on it, and let it chill for a good 30 minutes before rolling it gently into a square. Like Mary J Blige says, no more dramas. Phew! Ta-dah! A real pie! A tarte aux pommes, if you will. I cannot tell you how pleased I was with this. The pastry even puffed up on the sides like it was supposed to. What a fab little late-night snack! (To share with my family, of course). I was so relieved that the majority of the pastry was still ok, and that I hadn't wasted all that time and butter. I have carefully divided and wrapped up the remaining dough, labelled it and put it in the freezer. I now have 6 patons of puff pastry, and quite a few ideas on how to use them! (Including, yes, another attempt at palmiers). My second attempt from the Dr. Oetker Backen Macht Freude book was a classic Marmorkuchen (marble cake), which we baked late one night while waiting for Conan O'Brien's first Tonight Show to be aired. (Conan rules!) The Marmorkuchen happens to be the Titelfoto of the book (which you can see in my previous post). In the photo, the cake is baked in a loaf tin, but I prefer my marble cakes in a ring shape. I couldn't find my half-sized bundt tin (used here and here), so I dug out my mum's full-sized ring tin and made a full batch of the recipe. Now, mum's ring tin is probably older than me, and was made before non-stick surfaces were popular. (Or perhaps before they were even invented???) I buttered and floured the tin well. See Thanh? I can do it! The cake is in the Rührteig (literally: "mixed dough") chapter of the book, which means it is a standard creamed-butter cake. The main difference between this German Marmorkuchen and what I would call an ordinary butter cake is the use of Vanillezucker instead of vanilla extract, and Rum-aroma. (These, and other German baking goodies are available at The Polish Deli in Vic market, as well as other Delis around town). The cake took a bit longer to cook than expected, and we were unmolding it just as Conan was making his epic run from New York to LA. Ta-dah! It didn't break! Yay! Tin straight after unmoulding. I felt very proud of myself, heh. I almost considered slicing off the top, to give the unmoulded cake a flat base to sit on, but then I realised that that would have been most of the chocolate part. And the crusty parts of the cake are always my favourites. Yum! The Marmorkuchen was so delicious straight out of the oven, and I loved the smooth and even texture. I was a bit suss about putting 3 tsp of baking powder in there, but it didn't seem to affect the finished product negatively. The only thing about the cake I didn't like was the rum aroma - I wasn't accustomed to the taste, and found aroma a bit strong. However, my suggestion of leaving it out next time was flatly denied - "that's what makes it smell like the real Marmorkuchen my Mama makes!" Maybe I'll just reduce the quantity: a few drops, rather than half a Fläschchen.